This website is owned and operated by SEQ Legal. SEQ Legal provides a range of legal services to SMEs, particularly businesses in the IT and digital media sectors. Those legal services include publishing legal templates (via this website and on Contractology) and supplying legal drafting software (via Docular). We are based in rural Oxfordshire, about half way between Oxford and Reading. Many of the templates in the SEQ Legal library were prepared and are maintained by me, Alasdair Taylor. During my career, I have advised and prepared legal documents for a wide range of clients, ranging from international financial institutions to internet start-ups. Before setting up SEQ Legal LLP in 2007, I spent 2 years working as a solicitor in the Technology and Media Department of Manches LLP in Oxford. Before that, I spent 5 years working at Mayer Brown LLP a major international law firm (mostly in the firm's Intellectual Property and IT Group). 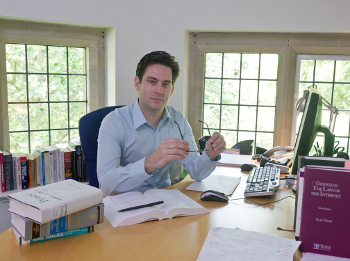 In addition to running SEQ Legal, I currently work as a consultant at ClaydenLaw, a friendly boutique law firm based in North Oxford specialising in IT law and data privacy. I hold degrees from the University of Essex and the Katholieke Universiteit Nijmegen (LLB English and European Laws), the University of London (BA Philosophy) and the University of Nottingham (MA International Relations), and have studied computer science at Oxford Brookes University. I also hold post-graduate legal qualifications from Nottingham Law School (Legal Practice Course) and the University of Bristol (Diploma in Intellectual Property Law and Practice). My legal writings have been widely published, including in Mondaq, Copyright World, Entertainment Law Review, Learned Publishing, In Business Magazine and Media World; and I have taught the digital publishing law course at the Publishing Training Centre in London.